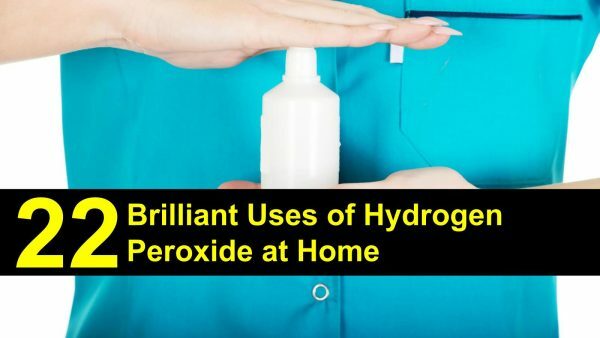 Hydrogen peroxide is a staple of many home first-aid kits, but there are many uses for hydrogen peroxide in the home that most people wouldn’t realize. In this article, you’re going to learn 22 uses of hydrogen peroxide at home. You’re going to learn what is hydrogen peroxide and we’re going to help you find out how to dye your hair with peroxide. Hydrogen peroxide works by releasing oxygen once applied to something. It is antiseptic, so it cleans the wound and prevents infection when applied to cuts and scrapes. You’ll find it in most stores that sell general merchandise and drug stores, in the first aid section near the bandages. Most stores sell a 3% solution that is safe for just about everything except for internal or food-grade uses. Make sure you read the packaging carefully and only use food-grade peroxide as directed (diluted) for internal use. This here explains best how does hydrogen peroxide work. Besides the many hydrogen peroxide uses like cleaning skin wounds, it is also a useful mouthwash. Rinse a small amount of it in the mouth to kill bad breath and germs, as well as treat canker sores. If you mix it with baking soda, it doubles as a whitening toothpaste. Periodically pouring peroxide on your toothbrush is a fantastic way to clean it as well. Use hydrogen peroxide in your ears for numerous benefits. Mix hydrogen peroxide with vinegar to make eardrops to prevent ear infections after swimming. If you have an ear infection, a few drops of pure hydrogen peroxide in each ear can help clear it up… and you can use hydrogen peroxide as a dog ear cleaner for your best friend. To remove ear wax, drop peroxide in your ear, followed by olive oil, then drain. Some people swear that a few drops of hydrogen peroxide in their ears can also help cure a cold. Peroxide isn’t just for cuts and burns on your skin. Soak in a warm bath mixed with hydrogen peroxide to treat boils. A peroxide bath is also detoxifying. Hydrogen peroxide can also kill parasites on skin. It can also clear up acne by rinsing your face with it. Pamper your feet with hydrogen peroxide. Whiten finger and toenails by soaking them in it, or make a foot bath with peroxide and warm water to soften calluses. Got foot fungus? Spray an equal mixture of water and peroxide on your feet every night. Hydrogen peroxide makes a great natural hair lightener. Use it to go completely blonde or spray it in for highlights. If you’ve bleached your hair blonde, peroxide helps cover your roots as your hair grows. Want to know how to dye your hair with peroxide? Check out our article on how to dye your hair with home remedies. If you wear contacts, hydrogen peroxide is great for you. It works in a pinch to clean your lenses, and some hydrogen peroxide features prominently in some cleaners on the market. Disinfect sponges and dishrags by soaking in peroxide regularly. Spray cutting boards, especially ones used for meat, with hydrogen peroxide to keep them sanitary. Use peroxide on dishes. Add some to your dishwasher to boost your detergent’s power. For stubborn food stains, you can make a paste with baking soda and hydrogen peroxide. Letting it sit on the stain helps the stain loosen, and baking soda is abrasive as you wipe the mixture off to get the rest of it. Clean out your refrigerator regularly to reduce odor, and use hydrogen peroxide to refresh it. Spray peroxide inside, let sit for a few minutes, then wipe down all surfaces. 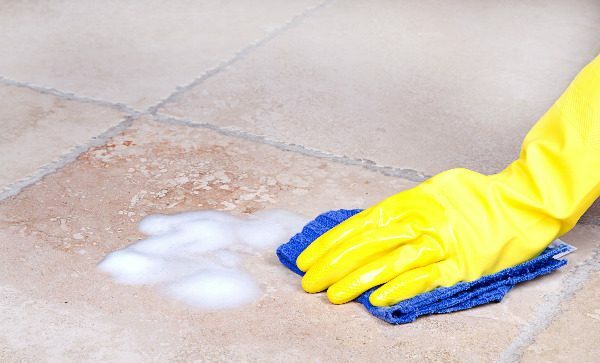 Hydrogen peroxide is a wonderful natural cleaning product and is great for cleaning tiles. Spray it on and wipe to disinfect surfaces, or let it sit after spraying to whiten tile grout. Hydrogen peroxide together with baking soda is the perfect grout cleaner. It also works on countertops. Let half a cup of peroxide sit on your toilet for around half an hour before cleaning as usual. You can also pour peroxide over the toilet brush to disinfect and get rid of any sewer smell. Use hydrogen peroxide in your tub. If you have mildew, stains or mold, spray peroxide on the area to eliminate mold and discoloration. Spray hydrogen peroxide on your shower curtain to fight mold, mildew and soap scum. Finish up your bathroom cleaning by using hydrogen peroxide for a streak-free mirror shine. Use hydrogen peroxide instead of bleach in your laundry to brighten whites. Great as homemade fabric upholstery cleaner. Hydrogen peroxide can also remove food and other organic stains from light-colored fabrics, as well as remove musty odors when mixed and used with vinegar. Got stains on light carpet? Spray hydrogen peroxide to get the stains out. Peroxide is a powerful ingredient in any homemade carpet cleaner. This way your DIY carpet shampoo won’t harm but still be effective. Be careful to test it out before using it to make sure it won’t bleach your carpet. Hydrogen peroxide is helpful if you use reusable grocery bags. A spray of peroxide inside can freshen, clean stains and disinfect. The same disinfecting function of peroxide helps to remove blood stains from sheets and clothes. Mix it half with water and spray the diluted peroxide directly on the blood stain. Let it sit and wipe the spot clean after some minutes. Food-grade peroxide is a great tool to help you enjoy produce. 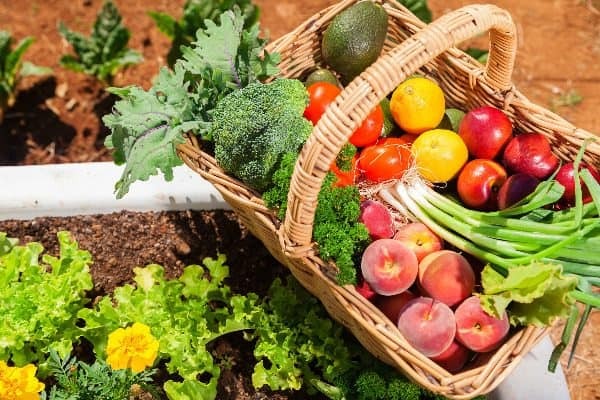 Spray peroxide on fruits and vegetables, rinse off, then spray again with vinegar and rinse a second time. Spraying the food removes all bacteria and pesticides, and also helps your fruits and veggies last longer. Keep humidifiers and dehumidifiers clean and mold-free by running hydrogen peroxide mixed with water through them. Mold in humidifiers is unhealthy, as it can send mold spores into the air you breathe. If you wear makeup, it is important to keep your brushes clean. You can clean synthetic makeup brushes in a solution of water and hydrogen peroxide, soaking them for five minutes. Doing so clears them of all makeup and bacteria. Furthermore, Hydrogen peroxide helps your plants to stay sanitized and by preventing bacterial rot. It kills weeds and fertilizes your plant. What an amazingly versatile natural ingredient. Hydrogen peroxide has many uses around the home when used safely. You can replace many household cleaning products with the more natural and safe hydrogen peroxide and feel safe that your home is clean and nontoxic. 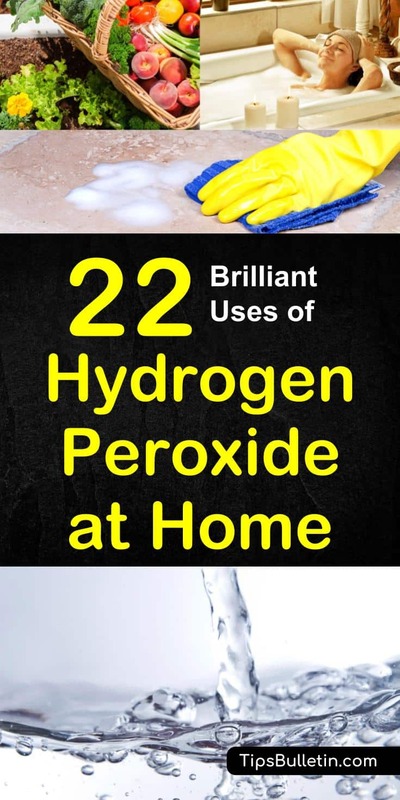 In this article, you learned 22 uses of hydrogen peroxide at home. You learned what is hydrogen peroxide and got a link to another great article on how to dye your hair with peroxide. Did I leave anything out? Let me know in the comments, and use the buttons below to share to Facebook, Twitter, and Pinterest!